At Last I’ve Planted the Garlic! I’ve been meaning to do it, waiting for a nice day, and yes, at last I’ve planted the Garlic. In between helping Erik cut and store our logs for the wood-burner, I enjoyed the sunshine this weekend, and spent some time tidying up the Kitchen Garden. But my Garlic was crying out to be planted, so I removed the last few Purple Haze Carrots, some skinny spring onions and the odd weed (you don’t get many in raised beds) then added a few bucketfuls of our home-grown compost and gently dug over the soil so that it was ready to receive its next recipient. To be honest, the most difficult part of all is is to separate the garlic cloves without damaging them or removing all the protective papery skin. But once I had done that, I used my trusty dibber, made the relevant holes so that the cloves were fractionally below the surface, then sprinkled loose soil on the top, watered then added a thick mulch (just love that word!) of shredded bark, and if, like us, you have mischievous squirrels, cover with some netting, and that’s it – sort of bedded in for winter. Softneck Garlic is generally suited to milder climates, but I have had a lot of success with it in East Yorkshire. Unlike the Hardnecks, they don’t form scapes, but they are ready to be harvested earlier, and will generally store for longer than the Hardnecks. Every year, I try out different types of Garlic. Beautiful Garlic – courtesy of Science.org. 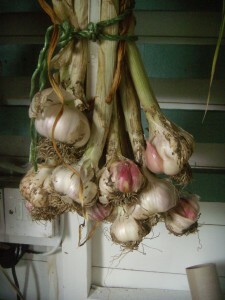 But my all-time favourite, more for its name (being an avid History fan) than anything else is Albegensian Wight Garlic. This is a softneck garlic that is harvested in late June, and keeps longer than most softnecks, often lasting until February of the following year, once dried off. It has a very white large garlic bulb. Its origins are in Southwest France, and is supposed to be the garlic of the 13th century heretical Cathars who built what they believed were impregnable castles on rocky mountainsides around Carcassonne and Renne in that area of France. After delving into my ancestors, I think I have some that hailed from that area in the very distant past. Scary! The other softneck garlic I planted this weekend was Early Purple Wight, which will be ready to harvest at the end of May/early June, to be eaten when very fresh and ‘green’, and will only last until October of the same year. So, obviously, the fresh garlic will pervade the East Yorkshire air as we use it in every recipe for a few months. The hardneck varieties I have chosen for this year are Lautrec, from the Toulouse are of France, which is harvested until June and lasts until the following February. Lautrec doesn’t like to be too wet, or waterlogged. Apparently French gourmands believe that this is is best of all for taste. Alongside this, I have added Bella Italian, from the Sulmon region to the south of Rome, Italy. As you would expect from an Italian garlic, this has a very strong flavour. It has a long storage time, lasting until March. The last of my hardnecks is the Spanish Rocambole from the La Mancha region of Spain. Again this is a very long lasting garlic, and should last until the following March. 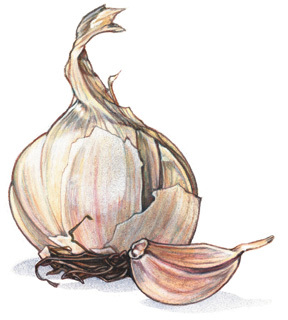 All Hardneck varieties of garlic produce a flowering stalk which is ‘the hardneck’. You should snap this off as soon as it appears and use in stir-fries etc. It is important to snap it off because this will double the size of the garlic bulb, so more for your money, and more to eat. Last year, I planted my garlic as usual in October. At the end of November we had snow, more than I can ever remember, and my garlic was covered for weeks with first snow, then that turned to thick ice, and I thought “Oh well, there goes the garlic – what a waste.” But come spring, the shoots appeared again and grew reasonably well, as you can see in the picture of it hanging in my shed. So, fingers crossed, next year’s crop will be worth the wait. Hope everybody else’s will be fine, as well. So, there it is. At last I’ve planted the Garlic. 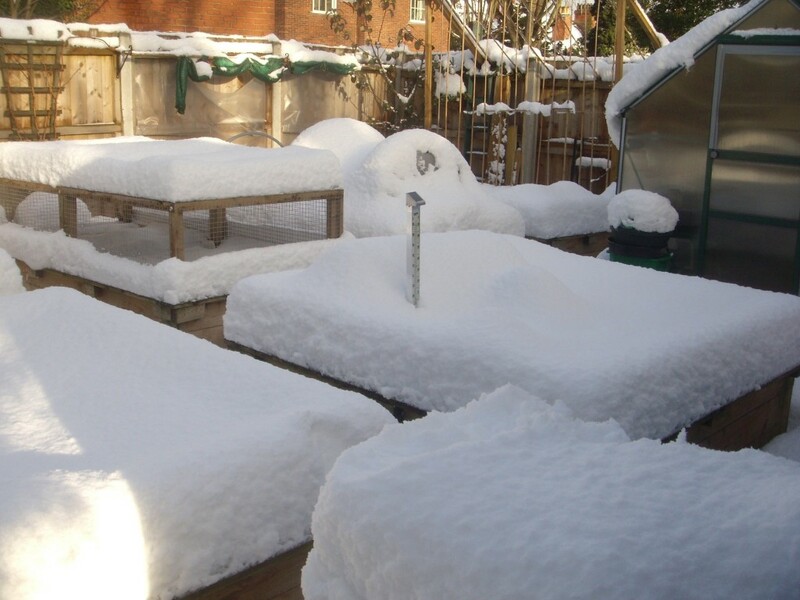 Confessions of a Kitchen Gardener – oh, and Books.